Web analytics firm StatCounter is out today with updated stats for the month of January 2013. When it comes to Internet usage, iPhone users this month held the No. 1 spot as Nokia experienced a significant decline during 2012. With Nokia’s share of mobile internet usage down 15.52-percent from 37.67-percent last January to just 22.15-percent this year, Apple was able to move into the No. 1 position for the first time despite experiencing a decline of 2.81-percent. Apple took 25.86-percent of mobile Internet usage in January, down from 28.67-percent last year. Nokia was also bumped to third position with Samsung gaining 7.85-percent to move into the No. 2 spot. However, it’s important to point out that StatCounter didn’t include iPads in its definition of mobile devices. 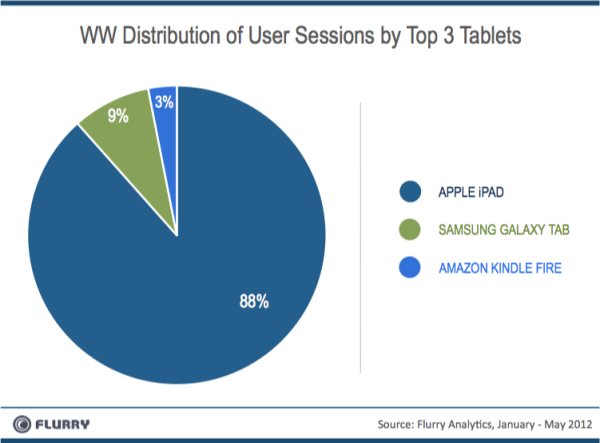 Analytics firm Flurry has dissected developer ratios for Apple and Google’s mobile platforms as their respective annual conferences are on the horizon, and research findings show the two companies boast a joint market cap of about $750 billion. 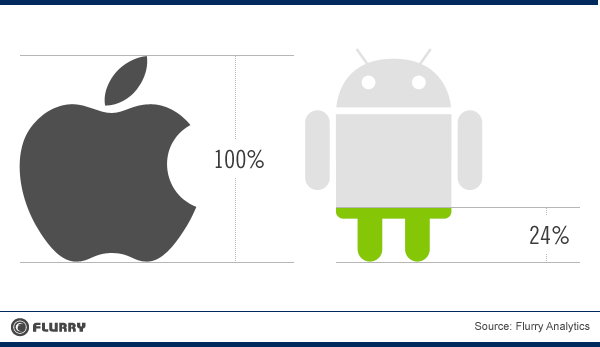 The study compared developer support for iOS versus Android by examining data collected from more than 70,000 companies across more than 185,000 mobile apps. The bar graph below illustrates developers’ loyalty to Apple: For every 10 apps that developers build, seven are for the iOS operating system. “While Google made some gains in Q1 2012, edging up to over 30% for the first time in a year, we believe this is largely due to seasonality, as Apple traditionally experiences a spike in developer support leading up to the holiday season. Apple’s business has more observable seasonality,” explained Flurry in a blog post. Another comparison on revenue generated by top apps for both Android and iOS uncovered the difference in revenue generated per active user is four times greater on iOS than Android. 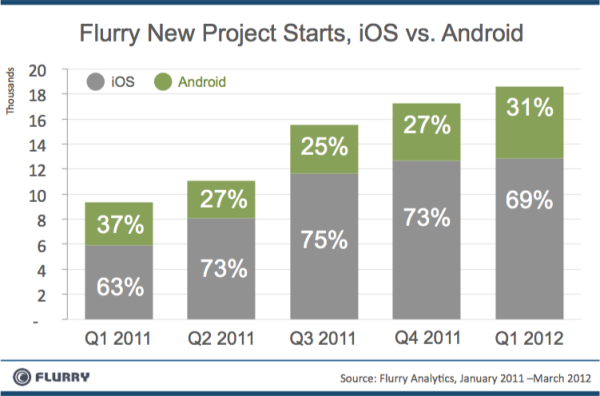 Flurry noted that for every $1 earned on iOS, a developer could expect to earn about 24-cents on Android. Apple’s Worldwide Developer Conference is June 11 to June 15 in San Francisco, while Google’s I/O conference is June 27 to June 29 in the same California tech-hub city. Visit Flurry for the full run-down and more graphs. Here’s some interesting news from the periphery. In Europe, where Microsoft was forced to institute a ‘browser ballot ‘upon the installation of Windows (giving Opera, Safari, Chrome, Firefox and IE equal billing), Firefox has just passed IE as the most popular browser on the continent. Given equal footing with other browsers, users just don’t pick IE (remember this ballot is only a year old and it will likely get much worse for Microsoft.